Seth officially became a member of the family two weeks ago on Aug 17th! Hooray! Well, from an emotional level, he always has been, but from a legal standpoint, we’ve been unpaid babysitters for the past 7 months. 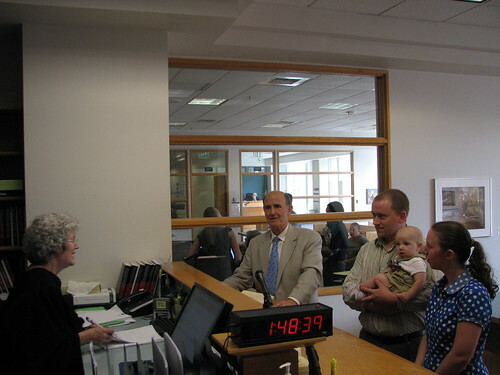 The process in Washington in this – the birthparents sign their forms before birth, and then have 48 hours to change their mind. 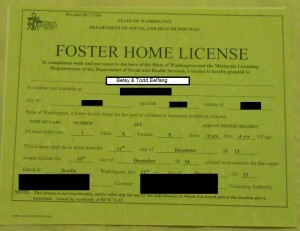 After those 48 hours, the child officially becomes a warden of our adoption agency. The agency places the child with the adoptive parents for caretaking purposes, but the agency comes and visits the family a few more times to make sure everything is going according to plan. If there are any major medical decisions to be made, the agency has to sign any paperwork issued (although the parents can make immediate decisions as needed), and travel to other states/countries requires even more paperwork. Once all the reports have been filled out and the necessary paperwork has been filed, processed, forgotten, etc, the adoptive family gets their day in court to finalize everything. I suppose this prevents the scenario in which the potential adoptive parents hold the baby for the first time, then immediately rip off their masks Scooby-Doo villain-style and announce that their real names are Baron and Mrs. Hitler von Kills-a-lot, the famous baby slave traders, and that the child will be going to work in their underground salt mines that afternoon. Otherwise, I can’t really imagine what would happen between the birth and the finalization that would so contradict all of the homestudies and documentation that had already been done, thus necessitating a “waiting period” like this. But so it goes. I’d like to say that it was some big dramatic moment, but Seth was as much a part of our family before the court date as he was after. The only thing that really happened was that we can get insurance cards, his social security number and birth certificate issued in the same last name that we have, and while I guess that’s pretty exciting, I felt somewhat underwhelmed. I don’t feel any more secure afterwards – I mean, it’s nice to have it all officially done, but the worries of our family being disrupted through some legal channels felt virtually non-existent to me, and I’m a worry-wart. It’s the official end of the journey, though, and that’s significant. Or, perhaps, the official end of the launching process of the journey, even though the launch happened a while ago. But it’s a journey that we’re all legally bound to be on together. Wait… that’s no good. Let’s try again. My human name is Todd, but you can call me Elynazarth, the elf druid. I am qualified to raise your child due to my 18 pt Wisdom score and a saving throw of 10 against colicky babies. Hmm. Pretty good. But if we really want results, maybe we should go for something more action-oriented. Wow. Writing a Dear Birthmother letter is harder than you would think. The Dear BM letter is one of the most important parts of getting selected from the pool. Once a birthmother has made a decision to place her child for adoption, the counselor presents her with a small book of Dear BM letters. The contents of the book are based on the “screening criteria” submitted by the adoptive parents – criteria such as readiness for transracial adoption, alcohol/drug exposure, and other things like that. Every adoptive parent whose criteria matches the birthmother’s circumstances is included in the book of letters. 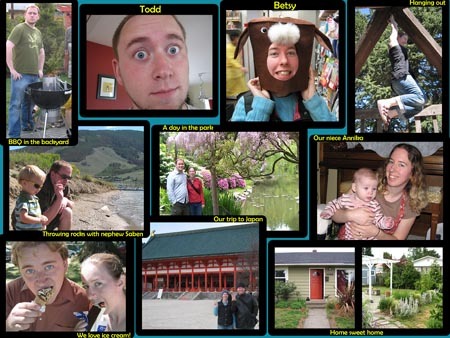 The birthmother selects a few names from the book, and views the full profiles (homestudy, auto-bios, photo collage, etc) of just those few families whose letter she liked. The DearBM letter is the foot in the door that gets the birthmother interested in learning more, and it’s therefore really important. We started our brainstorming by looking at some of the other letters on the website and the examples included in our informational packet. But we ended up feeling pretty intimidated by a lot of those – it seemed like everyone out there spoke 3 languages, owned their own companies, competed on the Olympic gymnastics team, and developed disease vaccines while flying their own plane to deliver food to African villages while carrying a small child on their lap to teach them about the wonders of giving. Whereas for me, uh… I got 3rd place in my fantasy basketball league. That’s my big achievement for the year. All we could do is talk about ourselves – but even that is tough. I’ve always struggled with writing cover letters for job applications, as everything I write feels “too boasty”. This letter was like a cover letter for the ultimate job, and I felt really weird trying to explain the awesomeness of my life. And Betsy is way more humble than me – it was going to be a tough task for the two of us to put together something we felt comfortable with. We made a handful of false starts, but never found something we felt comfortable with. We returned to reading the letters. And on the second time through, I noticed something different. I tended to skim over the people with fantastic achievements, and instead focused in on the people with the interesting anecdotes. The people who professed their love for tartar sauce. The people who were outraged about the demotion of Pluto to a “planette”. The people who seemed real to us, and the people that we could see ourselves hanging out with. That’s really the point of the DearBM letter – it’s not to impress everyone in the world, but to talk about who you are to help you connect with the birthmother out there who has a similar personality and interests. We also liked the way that a few people were bringing in quotes – either from friends or from each other. It seemed a lot more natural to us to write the letter that way. We each sequestered ourselves off in a room and wrote about each other, and returned to compare notes. If you are in a relationship, you might try that out someday – it’s a nice thing to do, even if you’re not adopting. While we often talk to each other about what we like in each other, there’s something to be said about seeing it written down on paper. Once we had our quotes about each other ready, and a sense of what we wanted to talk about in the surrounding paragraphs, we sat down to put it all together. The editing process went pretty well. We work in pretty different ways, but once we got used to writing together, a lot of the letter just flowed out. We just tried to highlight who we are – appreciative of the simple things in life, excited about friends and family, interested in food and books and music, and all that fun stuff. The picture for the letter was taken by our friend Mandy. She was really patient with us and very kind to come out on a freezing cold day in Edmonds, and the pictures turned out really good. Many thanks to her for doing that for us. All in all, I think the letter turned out really good. What started out as a tough and scary project wasn’t too bad in the long run, and actually a lot of fun. And now, with us finally in the pool, you can check it out yourself! 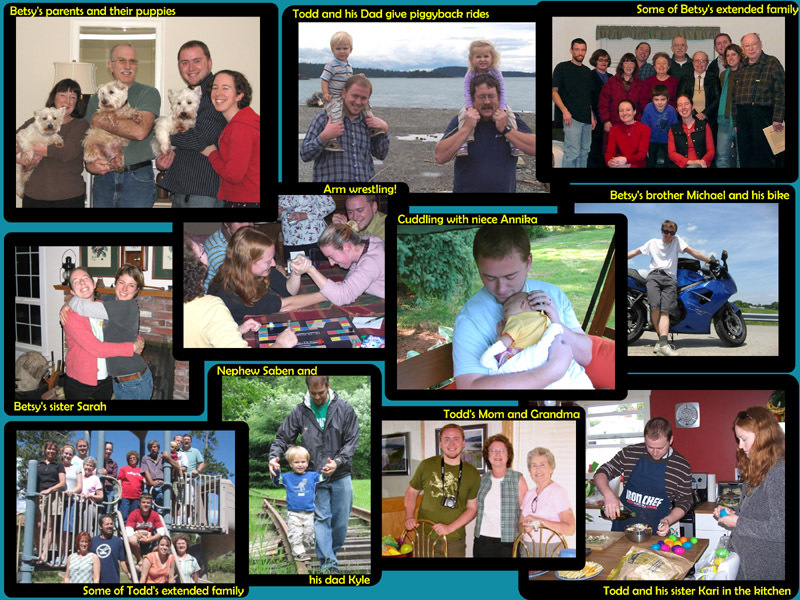 For me, the most fun I’ve had during the documentation process has been the creation of the Photo Collage. This document is designed to show what your life is like by displaying some of your hobbies, some friends and family, some pictures of your home, etc – it just helps the birthmother get a sense of who you are and what life will be like for their child. Is it a good quality picture? 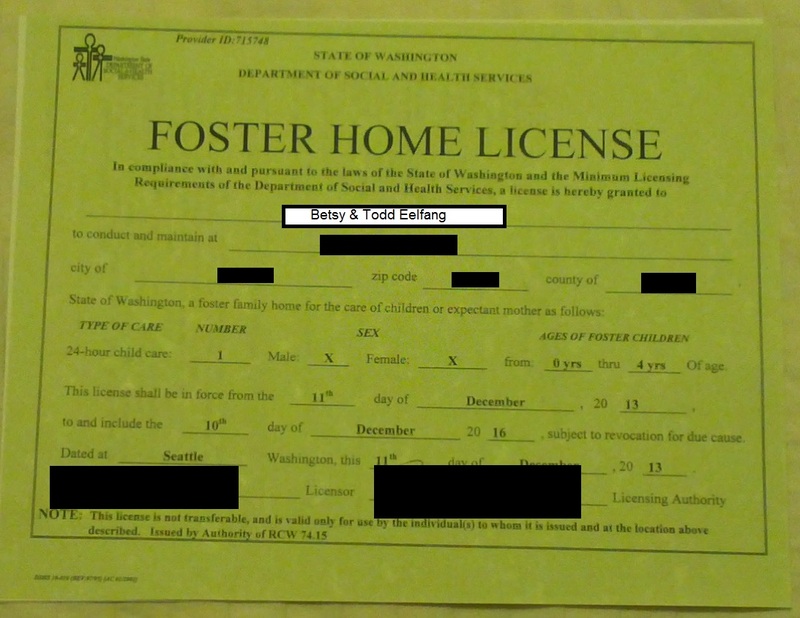 Does it say something important about Todd and Betsy? Our focus was on trying to portray us in a memorable and interesting way. For the birthmother who is looking at this, it doesn’t make a lot of difference if we get a picture of every family member or every friend – she’s more interested in seeing how we interact with the friends and family that are pictured. If we were making a collage that described our lives in entirety, or a collage that showed the most important things in our lives, you better believe that your picture would have been on the very front – but when created for this particular audience, accept our apologies if we didn’t have a colorful, high-quality, good facial expression picture of you and yours. Our first page of our photo collage helps establish who we are: we wear silly hats, we have wide eyes, we like children, we have a cute house, we travel to foreign countries or parks, and we like to eat. I was a little concerned that our counselor would veto the two main “portraits” as being too silly, but I’m glad she let us keep them. 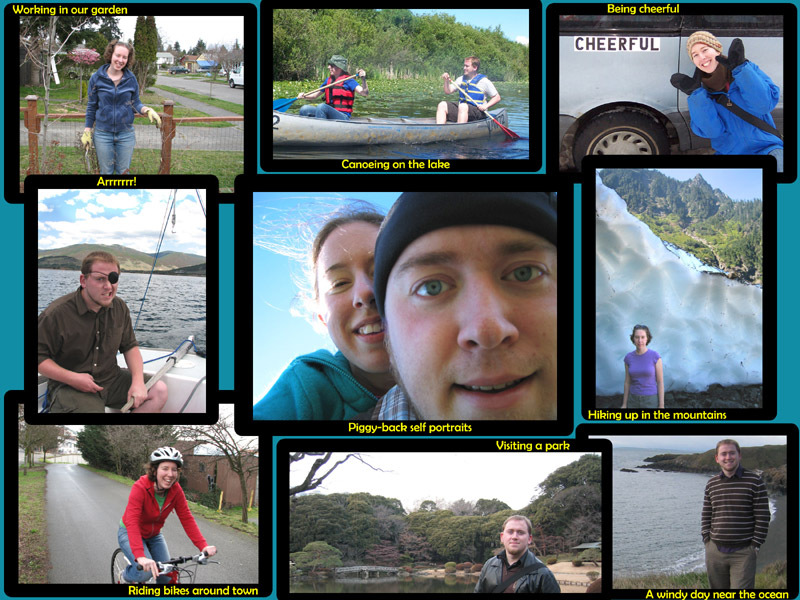 This was our second page, and while it does have some great pictures (Betsy on her bike, Betsy being cheerful, me as a pirate, our piggy-back shot), our facial expressions aren’t as great in this page.� We’re not really the most photogenic couple in the world (Betsy, of course, is always cute regardless). These were the best we could find out of about 400 or so pictures. It’s still a pretty fun page, though, and shows us out and about a bit more. 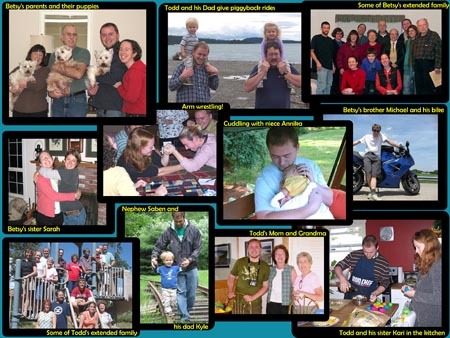 Our family page. 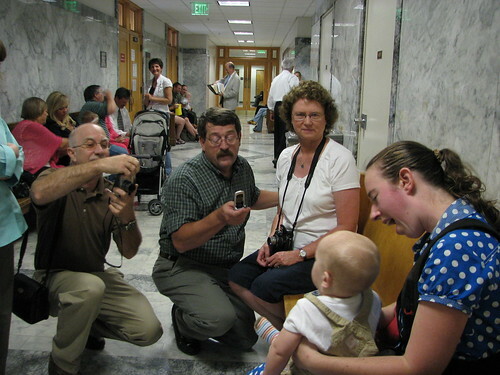 Betsy’s family was the hardest – her parents have never been much into taking pictures, and the last picture we had with them was at our wedding. We made a special trip up to their house to pose this picture. We also have virtually no pictures of her extended family – the one included is one of only two or three pictures I know of. On the other hand, I had tons of great pictures of all of my family members. Picking and choosing from that group was tough, and I had to make sure I was choosing for picture quality instead of my own knowledge about family trees and what-not. I’m pretty happy with the pictures that did make it, even though my Mom’s side of the family is under-represented. Our friends page. Again, it’s interesting to note which groups of friends generate the most pictures, and it’s definitely our Bothell friends. Several of these pictures came directly from Doug’s website or Heather’s flickr, and that helped bulk out our selection. This page is also where I got to work the most Photoshop magic. Aaron’s head (middle row, third from left, navy blue shirt) is actually from a different picture than the rest of the shot. Corey (middle row, furthest right) was almost entirely obscured by sun glare. I’m quite happy with how the edits turned out. Every picture got a little bit of tweaking for color/contrast/etc, but those were the biggest changes. 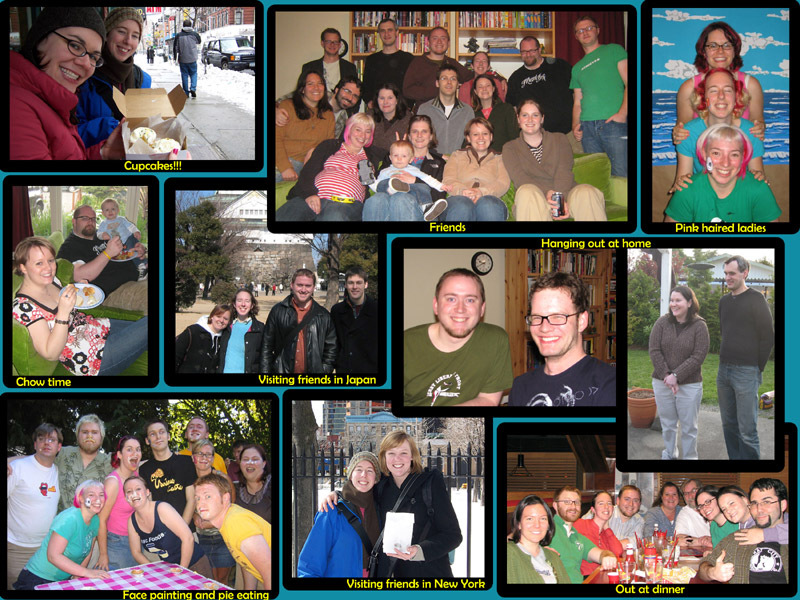 So, that’s our photo collage. I’ve printed out a copy of each, and have them hanging by our computer – it’s a fun photo album by themselves, and I really enjoyed spending the time to put this all together. To Bobby and Scott – we got your comment on our last post, and it was great to hear from you! However, I’ve searched through our seminar paperwork, and I can’t seem to find your contact info. If you send an email to todd (at) headsdownthumbsup (dot) net, I’d love to set up a time for lunch someday. Otherwise, I’ll keep looking for that business card and see if I can contact you first. Friend letter: Probably the most difficult part of this one was just deciding who to ask. I know that lots of you would be more than happy to help out and would be excited to be asked, and it was nice to have so many options. In the end, we asked our friends Cory & Hillary – they’re great friends of ours, they’ve seen us interact with children, and we knew they’d do a good job. 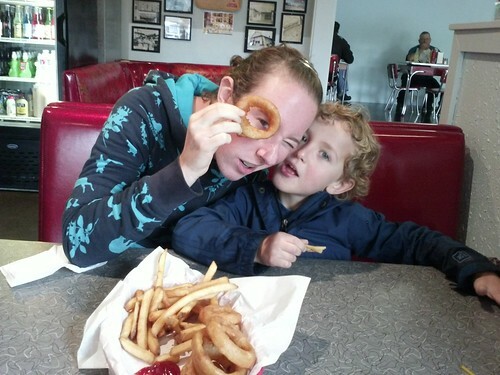 Sibling letter: My sister is a great writer/blogger in her own right, and she’s the only one of Betsy’s and my siblings who has children of her own, so we asked her to help us out with a letter. Parent letter: If the sibling letter was coming from my family, it made sense to have the parent letter from Betsy’s family. Her parents agreed to write a letter as well. “Authority figure” letter: And this is where it starts to get a little more difficult. It was easy to decide on who we wanted – our priest – and we knew he’d be willing to do it. But Betsy and I had still not told him about our adoption journey. It’s always weird to try to find a point in casual conversation to bring up the fact that we were in the middle of the adoption process. From the first times we were announcing it to our friends to starting to talk to employers about “contingency plans”, it’s always been tough to find a way to start that conversation. We had been meaning to tell our priest for the last few months, but never found the right time. It’s just awkward to be shuffling out at the end of church, saying our “hello”s and “have a nice day” and “that was a nice sermon” and “oh by the way, here’s a huge piece of news about something that is going change our lives forever”. It just never came up, even though we knew that we would have to tell him some day – it would have been a bit awkward to just wander into church someday with a child in our arms to the surprise of everyone. When we decided to ask him for a letter of recommendation, we knew this would give us the motive to tell him, even if it didn’t make the opportunity any clearer. In this case, though, opportunity didn’t just knock, it walked up to the front door, opened it up and made itself at home on the couch. We were doing some work cleaning up after church when our priest approached me and asked if he could come over to our house some time in the near future. 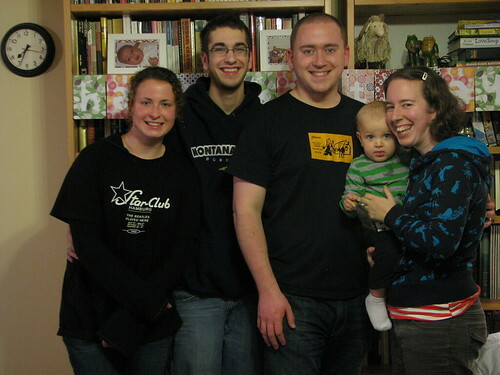 Our names had made their way up to the top of whatever “pastoral visit” list he maintains, and he wanted to come over and just spend some time talking and catching up.� He had no idea that we were planning on talking to him, but it worked out perfect.� We set a date, and were excited to have him come over. Several months ago, during the summer, we had noticed a mouse in our house. The first time we saw it, I was able to track it into the bathroom, and had it captured underneath a tupperware container. However, in the act of trying to slide a piece of cardboard underneath to make a floor to my impromptu trap, a gap had opened and the mouse darted out. We bought some live-catch traps from the hardware store the next day, but spent the next few months catching nothing. After getting increasingly frustrated by the little mouse poos that we found around the house, we researched live traps further, and found one that was universally recommended. Within 2 days of putting out the new trap, we caught our mouse. Betsy drove the little guy out to the woods and released him, and we were both thrilled. That evening, our priest was scheduled to come over for his visit. We spent an hour straightening up, vacuuming, and just generally making the house look as nice as possible. When our priest came over, we made him a cup of tea, and we had just sat down with a plate of cookies when he started and exclaimed, “oh! I think I just saw a mouse!” Our mouse issue wasn’t fixed after all, and our priest had seen one of the critters almost immediately. Fortunately, he was good natured about it. He said he had rats in his house that he was dealing with, and knew how difficult it can be to completely mouse-proof a house. We spent the next hour catching up, talking about the young adult programs at our church, and then letting him know about our plans and having him agree to write a letter for us, despite our rodent infestation. Neighbor letter: This was by far the most stressful letter of all for us. However, as I sit here, trying to compose my thoughts about it, I’m realizing that it was also probably the most silly letter for us in terms of how much we over-thought it. We moved into our current house about 8 months ago. As we were moving in, we met our next-door neighbors, an older couple with grandchildren. They’ve always been extremely friendly to us. When Tom saw me mowing the lawn with our manual push-mower, he brought over his gas-powered mower and told me I could borrow it any time I wanted. We’ve said hello over the fence several times, and they’ve been as nice of neighbors as you could ask for. However, Betsy and I tend to be somewhat shy. We were more than happy to exchange pleasantries when we saw them in their yard, but it’s a pretty big jump from saying hello to asking for a personal favor of a somewhat intimate nature. While I understand why our agency asks us to have a neighbor submit a reference letter (a neighbor has a more objective viewpoint and can see how we treat our home and how we treat people who aren’t our close friends), it’s a little bit awkward to ask someone to write a letter vouching for your character when you’ve exchanged a few dozen words total in the amount of time you’ve known each other. So that letter ended up being the one we sat on for a while. I think we kept hoping that we would see them in passing, and be able to bring it up, and not have to just show up on their doorstep unannounced. But even that strategy didn’t work – Tom actually came over to our house, handed us some mail that our postman had misdelivered to their house, and even then I lost the nerve to make the request. After a week, though, we finally got together the courage to walk over and just knock on the door. As I was standing there, I realized I hadn’t made an unexpected knock (i.e., not preceded by a phone call or other conversations with a friend) on someone’s door in probably 10-15 years, around the time when I had last gone trick-or-treating. Doing it again was a bit awkward. We did knock, though, and… nothing happened. No one home. The next night, we picked up our courage again, knocked again, and still no one was home. We tried again a third night with the same results, and finally left a letter for them explaining the request. Karen gave us a call a few days later, and she was as gracious as ever about being willing to do it, and offering lots of advice on the best places for baby supplies around the area. Next step! The rest of the paperwork included a 3-5 page auto-biography from each of us, which I’ll write about in a separate post, a doctor’s visit for each of us, a few more papers to sign, and the next in the series of checks of escalating size. After getting this paperwork in, we contacted our counselor to discuss times for the homestudy process – one interview with both of us in our house, one interview each separate in her office, and a second interview with both of us in our house. Normally, these interviews take about 3-4 weeks, and we expected to get a start on them near the end of the year. Instead, we have our first in-house on Fri, Dec 14th, our individual interviews early the next week, and our final in-house on Fri, Dec 21st. I’ll keep you posted with the latest updates, but if you don’t hear one for a little while, it’s probably because we’re freaking out about the fast pace. the eelfang chronicles is powered by	WordPress 3.6 and delivered to you in 0.887 seconds using 37 queries.